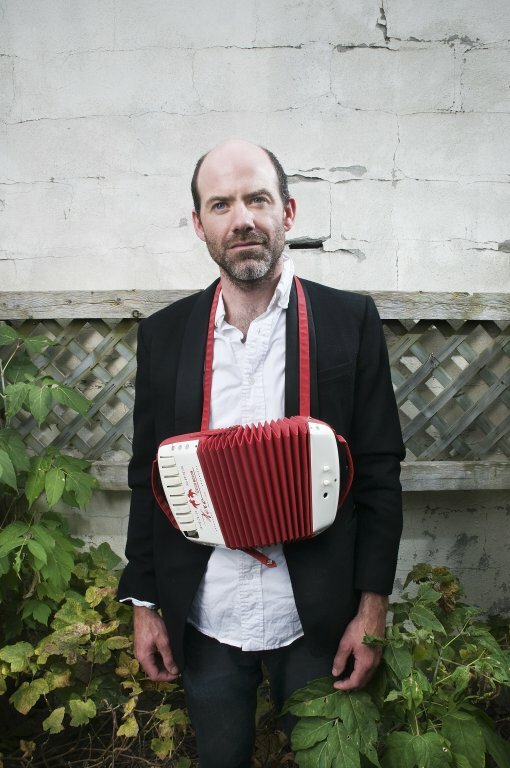 It’s been a big weekend for Canadians in NYC (Bahamas, Gentleman Reg, Hidden Cameras, and Amy Millan all played shows), but one act who may have flown under your radar is Toronto’s Andrew Vincent. In 2009, Andrew put out a record called Rotten Pear which got my attention, it’s a bit of a hybrid affair shifting between acoustic folk (with toy accordion) and electrified rock with a bit of a country twang. According to Andrew’s MySpace blog, the album is a mix of some bedroom recordings that date back as far as 2004 along with some newer tracks recorded in the studio, (which kind of makes sense after listening to the album in its entirety). The lyrics are pointed and insightful throughout the record, and despite the layered on band on a few tracks, it still comes across primarily as the vision of a single singer/songwriter (which is a good thing). The more acoustic tracks are really the main draws here for me, and I think they would probably sound great live at a place like The Living Room, which just happens to be where Andrew plays the last of his NYC shows on Sunday (Nov 8) at 8PM sharp. Rotten Pear originally came out in Canada in early January on Kelp Records and was just released last week (Nov 3) in the US on Carrot Top Records, having said that, the best way to purchase it seems to be via Amazon mp3 or iTunes. More Andrew Vincent tour dates after the jump.